An earthship is an off-grid home that produces its own energy, captures its own water, treats its own wastewater, grows its own food and passively collects the sun's energy for heat. That's the idea, anyways. But ever since the Kinney Earthship was built in the summer of 2014, Duncan Kinney has received many emails about one particular subject: how does it hold up so far north? When we last visited the Kinney Earthship it was a smokin' hot 30 degrees Celsius outside. 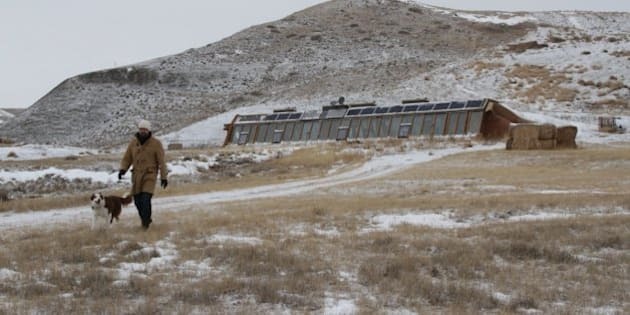 Michael Reynolds and his crew from Earthship Biotecture, along with a group of volunteers, were just finishing work on this radically sustainable home. An earthship is an off-grid home that produces its own energy, captures its own water, treats its own wastewater, grows its own food and passively collects the sun's energy for heat. That's the idea, anyways. But ever since the Kinney Earthship was built in the summer of 2014, Duncan Kinney has received many emails about one particular subject: how does it hold up so far north? "I still get emails from people interested in earthships and they're like, "How does it do in the winter? How does it do in the winter? How does it do in the winter?" says Kinney. Duncan is the former editor and production manager here at Green Energy Futures. He and his parents Glen and Dawn built their Earthship on a plot of land along the Little Bow River just north of Lethbridge, Alberta, Canada. I remember the prairies of Southern Alberta as lush and green. Today, as I pull my Rav 4 through the rolling hills, the area more resembles a lunar landscape. The word that comes to mind is bleak. But as I look closer, some life stirs. Down in the coulees a herd of mule deer forage among the bits of land that poke through the sheets of snow. On the neighbouring property, cows are grazing, while a flock of about 500 waterfowl lift off from a field that still has corn stalks from last year. I question the wisdom of the waterfowl wintering in a place where temperatures can drop to -30 degrees Celsius. But maybe they would say the same of the Kinneys and their Earthship. "It's the middle of January," says Duncan Kinney. "It's been cloudy and crappy weather for four or five straight days. It is about -15 outside right now and here we are inside and it's 20." The Earthship's primary heating system is its passive solar design. A greenhouse that covers the entire front of the home captures plenty of heat, even in the winter. The Kinneys added a petite wood stove, tucked into a corner, which provides supplementary heat to the living room, kitchen and master bedroom. While I was there, the overnight temperature dipped to -22 degrees Celsius outside but remained a comfortable fourteen degrees inside the Earthship. That's just one degree cooler than my city home at night with its setback thermostat. On a sunny day the inside temperature bounces all the way up to 22 degrees from solar heating. On cloudy days the Kinneys light a fire in the morning and hardly notice the difference. The whole goal of earthship design is for it to be an independent vessel, sailing on the Earth, providing its own essential elements. Perhaps this is why Glen Kinney starts my tour in the greenhouse. "You can see even during this cold time of the year, we've got some tomato blossoms," he says, cradling the blossoms in his hand. The greenhouse goes down to just a few degrees Celsius on the worst nights of January, but soars back up to the mid teens each day. Peppers and tomatoes ripen on the vine. "For greens, we've got some Swiss chard and I planted some turnips just to get some turnip greens," says Glen. "We got some green onions that are growing here and some different herbs. I think that's rosemary there and some parsley." The greenhouse is the Earthship's garden, its water treatment centre and passive solar heater. The off-grid Earthship gets electricity from a 3.8 kilowatt solar system with battery storage. While I was there, and for only the second time since it was completed, the Earthship ran out of electricity. "Everything that's on DC is still running," says Duncan. "The fridge is still running. The water is still running." Essentials such as the fridge and water receive power because they are modified to run on direct current (DC) power, the stuff that comes right out of the solar module and batteries. The alternating current (AC) power comes from an inverter that gets turned off when the battery reserves get low. "Right now, we're just charging up our system with this weak morning daylight in order to tick on our AC as soon as we can." The Kinneys could have installed a larger solar system, but they are conservationists by nature and chose this size energy system to match their needs. The family seems to get along fine without satellite TV for a few hours. Part of the reason they are able to get away with such a small solar system is they also have a propane system. "We do have a big propane tank off the side of the house, which we've had for a year and a half now," says Duncan Kinney. "It's still 65 percent full, so we don't use very much of it. That's what we cook with, a natural gas stove that's been converted to run on propane." Propane is used for the stove, clothes dryer and for the back-up on-demand hot water system. We enjoyed our morning coffee under candle light while the weak morning light began to slowly recharge the solar batteries. "The water system here has been incredible. It's one of the best features of the house," says Duncan. Water is collected from the roof and stored in a 26,000-litre cistern system buried beneath the earth behind the home. Greywater -- anything that doesn't run through the toilet-- is piped into the greenhouse to water plants and undergo natural water treatment before it is reused again in the greenhouse or in toilets. "We get about 13 inches of rain a year and there's cactus everywhere, so it's not like we're getting a lot of rain," says Duncan. "But [our supply] has never been below three-quarters full. Aside from having to clean the filters when you get a lot of silt in the system, it's been one of the best parts of this house. It's been rock solid." We visited the Earthship in the middle of a Canadian prairie winter after a series of cloudy days, and the only hiccup was a short-term loss of AC power. It is indeed an independent vessel sailing much more sustainably on the planet Earth.